Sigma 17-35mm F2.8-4 EX DG HSM review – an old, cheap, and… great wide-angle lens! With a DxO Mark Score of 20, this wide-angle zoom is indeed a good-quality lens. Both lenses achieve the same DxOMark overall score of 20. When looking at the results a bit more closely, the Sigma’s quality seems actually somewhat lower (see also the DxOMark score map). In fact, the Sigma’s performance drops off a bit for the greatest focal lengths (starting at 28 mm), due to the fact that the Sigma doesn’t maintain a constant f/2.8. To compensate for the loss of brightness, one must augment the ISO sensitivity – and consequently, noise goes up as well. 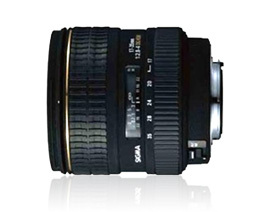 The Sigma 17-35mm F2.8-4 EX DG Aspherical HSM Canon is a very good lens for the price. While each lens has its strong and weak points, the Sigma quite frankly manages to hold its own against its pricier Canon rival.